Radiolink Plus – Sullivan Wire Rope Inc. 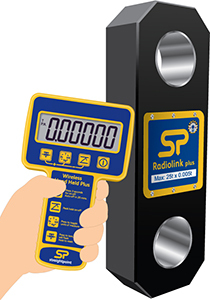 Capable of both weighing and dynamic load monitoring the latest Radiolink Plus is constructed of high-quality aircraft grade aluminium and features an advanced internal design structure. This internal design structure not only provides the product with an unrivalled strength to weight ratio but also allows the use of a separate internal sealed enclosure providing the load cell’s electronic components with IP67 environmental protection even with the battery cover plate missing, making this industry leading dynamometer even more suitable for use in the harshest environments.